I really, really liked having money. Past tense. It alienated me from a lot of the people that I love, and it made everything so, so easy. When you have to spread your money over dozens of bank accounts, and talk to investors and accountants and philanthropy experts and charity cases and hangers-on and family members that are suddenly in dire straits, it’s easy to feel very well-liked and wanted. Your phone rings constantly and there are people around, constantly. It dawns on you that what they want is your money, not you. And then you change your phone number and you stop giving out your money because it suddenly is very clear that everyone needs money, and they will always need money. I bought the place on the beach, and suddenly became very unreachable. I wandered around the many rooms, and I kept them spare. There will always be furniture, and it felt good to have space. I needed space. And then I didn’t need space, I needed people again. Life is full of cycles, and they are usually dictated by the need for money and then the need for people, or both at once. I used to work those little jobs where, paycheck to paycheck, all that matters is the time where you aren’t earning money, when you need to remember what life is all about, and it feels like what life is all about is spending money. But when you have money, it’s obvious that what you needed all along were people to spend that money on, and once you don’t need money for yourself. It’s cyclical. You need people and money in equal amounts, and I tipped the scales. The place on the beach was a stark white mansion with lots of rooms and hardly any furniture. I looked out at the sea and felt small and unimportant and it was exactly what I needed. I threw a party when the need for people became like the need for water in a sea of sand dunes and dehydration. Hundreds of people came to that party. I had a band play, with 3 girls singing songs in perfect harmony. Lots of sha la las and doo wa dos. The words that didn’t mean anything drifted around the party, amplified. The three girls were beautiful and people were transfixed by them as much as they were transfixed by the opulence of the place they were in. Champagne corks popped and fizzed, adding a discordant percussion to the music that everyone agreed was celebratory and inviting. I wandered around the party in a white linen suit, enjoying a tiny bit of anonymity. No one asked for money while the party was happening, and most everyone there didn’t know I was the person that owned the house, and the yard, and that view of the cliff. I flitted around the party in the background, content. And then I saw you. You were lit by the fire and you were laughing in a light blue simple summer dress. Your eyes, in particular, caught firelight – you were surrounded by people and you hung on everyone’s conversation like delicates on a clothesline. You stood up and danced sometimes, subtly twisting and turning to the music. Everyone followed suit. I talked to you about lots of things, when I finally got the nerve. You were a very willing audience. You loved the music, you knew one of the girls in the band. I listened to you tell stories about the people in the group, and every silence in our conversation felt orchestrated so that you could hear the music and listen to the ocean and drink from your champagne glass that I filled and refilled. After the party ended, and everyone left, you stayed. I put you in one of the rooms that had a bed, and I gave you everything you needed. I bought you clothes and I convinced you to take a vacation from work. You invited friends over, we cooked for them. I was so obviously in love with you that it felt painful – I remembered what I was in high school and college and after college and you never took advantage. I showered you with gifts and affection and you seemed content to take what I gave you without needing any of it. “It’s too bad you have the fence,” you said one morning. There was a fence that divided the house from the sea, it marked the edge of the cliff. It was low and made of cement and had small windows cut into it. I always pretended it was for archers, if I ever had to defend my castle. “It keeps people from falling over the edge,” I answered. You were nuzzled into the crook of my arm, we were lounging in a chair, watching the clouds change color from the sunset. You helped me fill the house with furniture. We always drank champagne. You told me you felt like you were on a long vacation from life, and I told you that this was all you had to know for the rest of your life. Your life could be a vacation. We stood on the cliff a lot at night, watching the sun disappear. 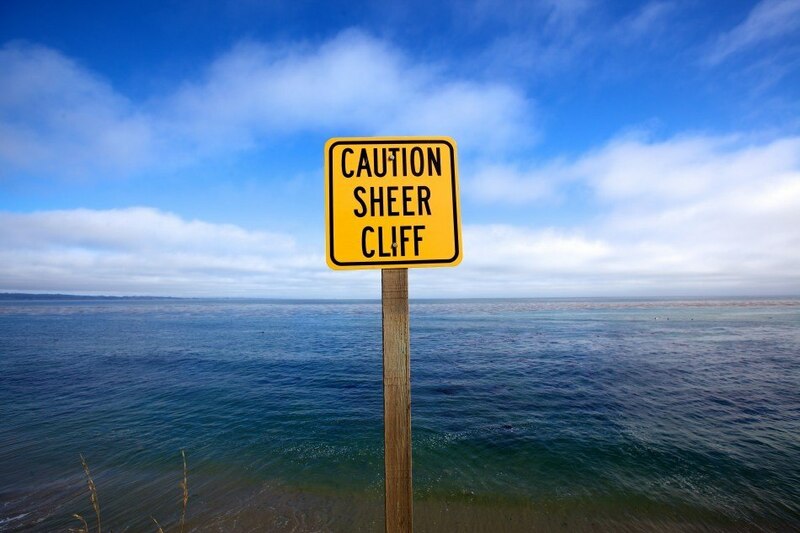 I worried about holding parties or letting anyone onto my property, because the cliff was tall and the beach was treacherous. The fall could kill you. “Stop worrying, I won’t fall,” you told me. I worried anyway. I stopped having parties and kept you instead. It felt treacherous, but you told me not to worry. One morning, I woke up and you had put a sign at the edge. Posted on Wednesday January 4th, 2012 Tuesday August 19th, 2014 by Max Elman. This entry was posted in German Translations by Sandra Kathe, Photos & Stories and tagged beach, fire, house, love, money. Bookmark the permalink. crap, i knew this was going to go here as soon as i saw that cliff sign and usually that makes me stop reading, being sensitive and all that. but not this. this was brilliant.